In order to make quick work (okay, quicker work) of making christmas cards, I took 4 A2 panels and stamped them with the same plaid background. To make the plaid I used Simon Says Stamp ‘Jumbo Stripe’ and a mix of inks: gold, schoolhouse red, catkin, steel blue and soft navy. From there I used a mix of images I’d previously colored but hadn’t made into cards yet. Read further for photos and details on what I used! The main image for this card is from The Greeting Farm which I colored in with Kuretake Zig Clean Color Brush Markers. After cutting her out I used my Memento brush tip to “paint” around the outside of the image for a finished appearance. Once I figured out her placement I stamped and heat embossed my greeting from Avery Elle in Stampendous Detail Gold. 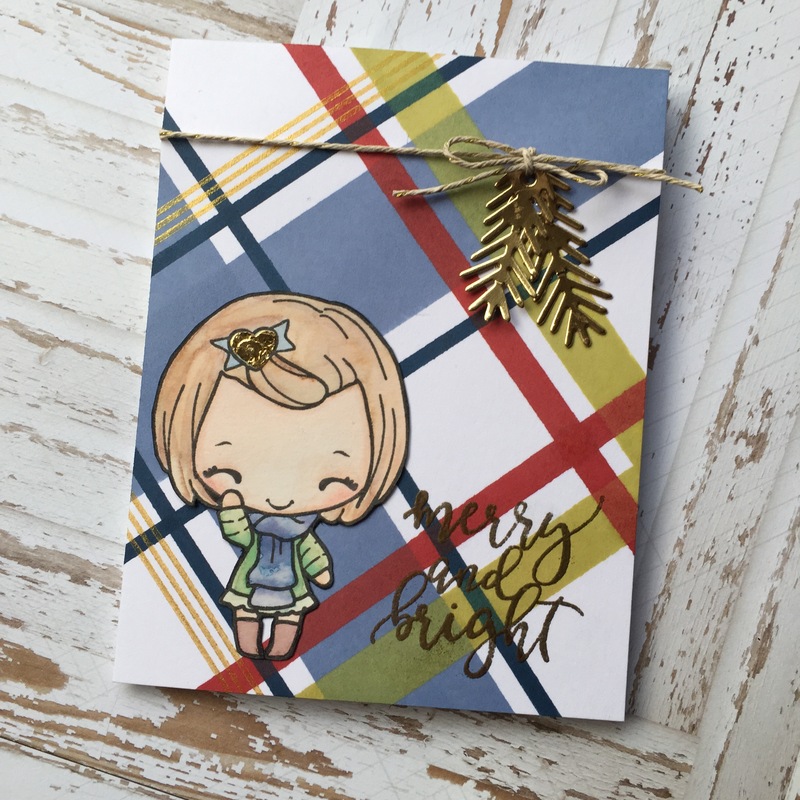 I finished the card by die cutting a pine tree bough from gold paper using a Concord and 9th die cut which I attached to the card with some twine. 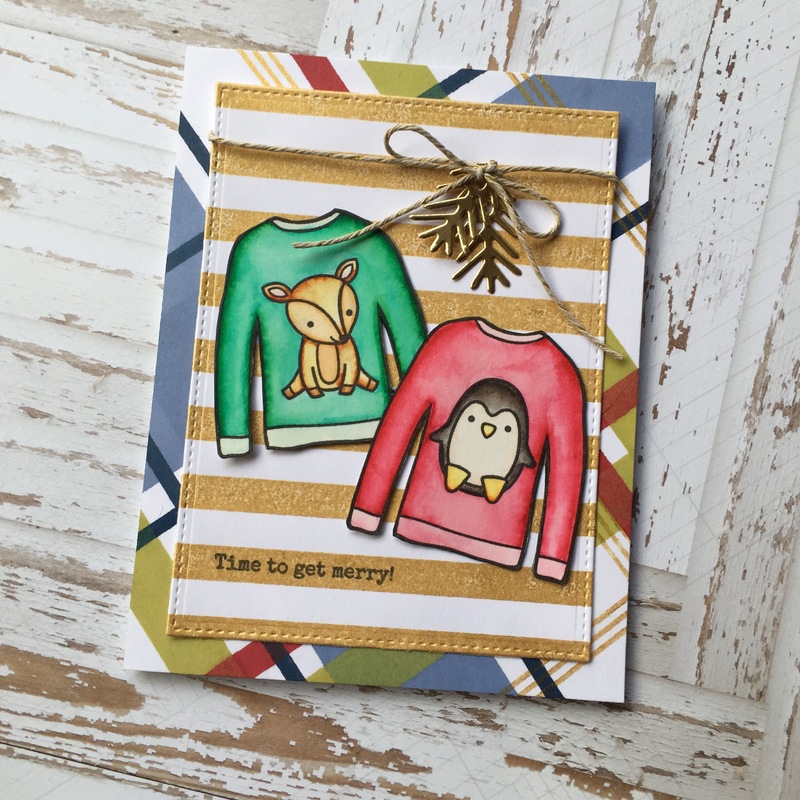 The focal image on this card is Simon Says Stamp ‘Ugly Sweater’ combined with sweet little animal images from Lawn Fawn. I attached the sweater to a die cut panel that I had stamped in a gold stripe. The sentiment is from an Ellen Hutson Christmas set and was stamped in Versafine ink. 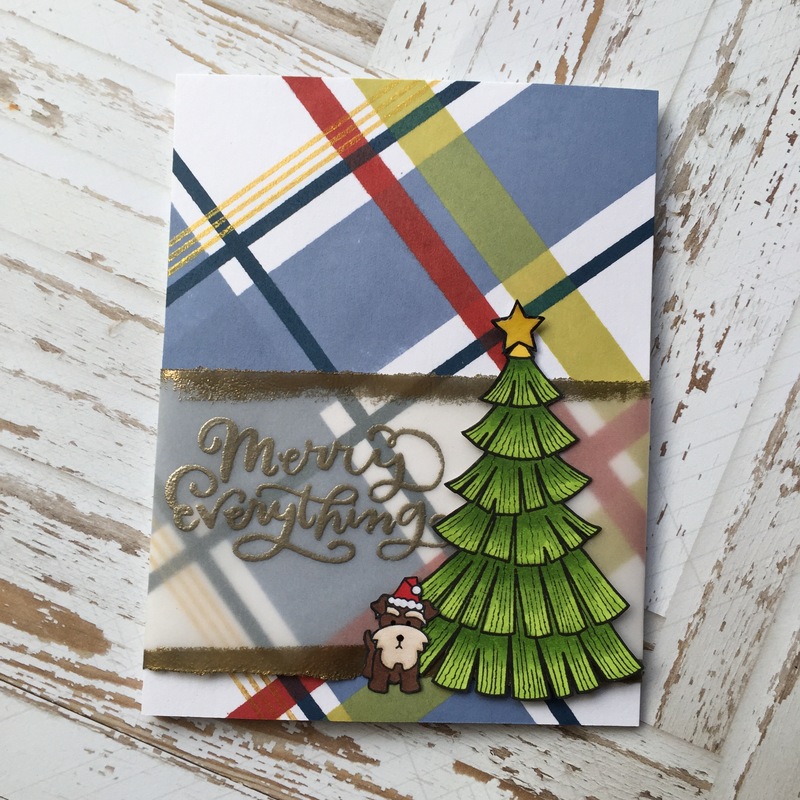 Like the previous card, I finished by attaching the pine tree bough die cut with twine. Truthfully, this little angel has been sitting in my ‘unused’ pile since last Christmas. 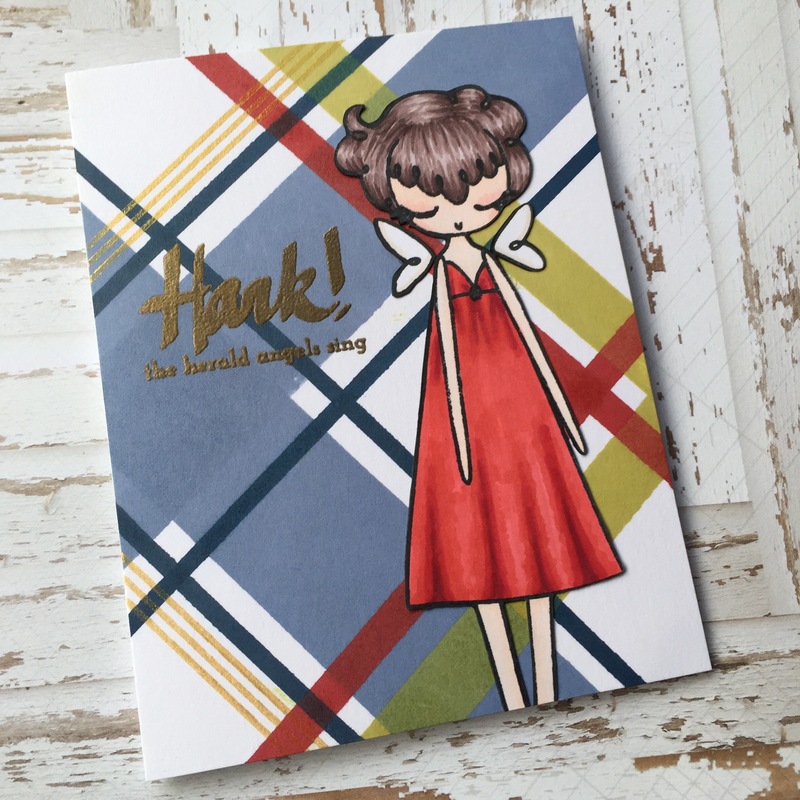 Her left wing had been lopped off by my die cutting machine and I’d been too lazy to fix her…until now! She is from an older kit by The Greeting Farm and was colored in using copic markers. She is actually quite tall and I trimmed her down to balance out the card. The sentiment is from Altenew and was heat embossed in Stampendous Detail Gold. Last, but not least, is this card using a mix of Sweet Stamp Shop and Mama Elephant images. I colored both the pup and the tree in with copic markers. I ripped a piece of vellum and then embossed the edges with detail gold and then the sentiment in Ranger Liquid Platinum. The sentiment is from Studio Calico. I need those stamps to make the background! I thought it was a patterned paper. Great cards!